This exhibition features works in the University Art and Museum Collections by Australian Indigenous artists from Arnhem Land and the Tiwi Islands, both situated in Australia’s Northern Territory. While culturally and linguistically distinct, the practices of mark making, painting and carving – with their roots in storytelling and ceremony – are deeply imbedded within Tiwi and Arnhem Land cultural and spiritual traditions. 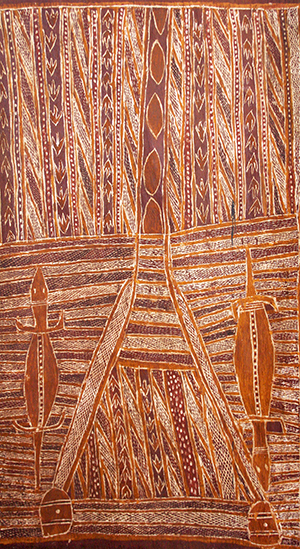 These artists have long been making artworks from natural ochres, using imagery that expresses their profound knowledge of and connection to Country, its creation stories and its ceremonies. Earth and spirit come together in almost every aspect of Indigenous life – universal law, ceremony, sacred sites, and in the artworks that become infused with ancestral power through their making. From Earth to Spirit presents a range of art works in various mediums including bark paintings, ochres on canvas, works on paper, prints and carvings, from the University Art Collection and Senta Taft-Hendry Museum. This includes paintings recently donated by Dr Milton Roxanas, through the Australian Government’s Cultural Gifts Program, and further works loaned by friends of the University Gallery: Aboriginal & Pacific Art Gallery, Sydney and private collector, Catherine (Kate) Croll.